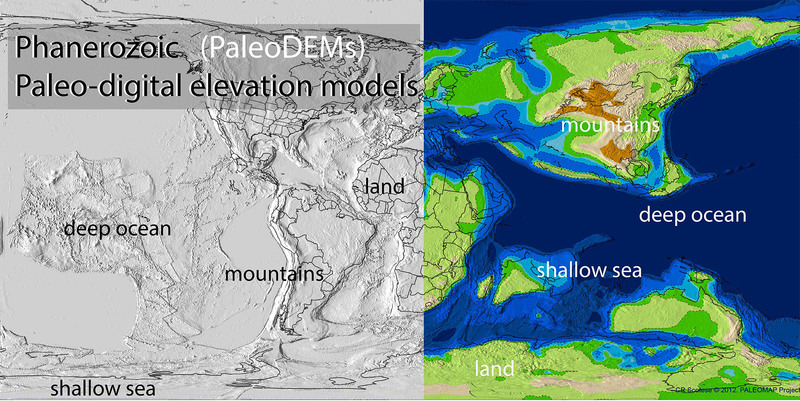 A paleo-digital elevation model (paleoDEM) is a digital representation of paleotopography and paleobathymetry that has been “reconstructed” back in time. This report describes how the 117 PALEOMAP paleoDEMS (see Supplementary Materials) were made and how they can be used to produce detailed paleogeographic maps. The paleoDEMS describe the changing distribution of deep oceans, shallow seas, lowlands, and mountainous regions during the last 540 million years at five million year intervals. Each PaleoDEM is an estimate of the elevation of the land surface and depth of the ocean basins measured in meters (m) at a resolution of 1×1 degrees. The paleoDEMs are available in two formats: 1) a simple text file that lists the latitude, longitude and elevation of each grid point, and a more compact version in “netcdf” format that can be read using NCL (NCAR Command Language) software, familiar to most climate modelers. For more information about this resource, contact Christopher R. Scotese at cscotese@gmail.com.